A new initiative taking root at Illinois Central College in East Peoria is one example. The Illinois Sustainable Ag Partnership (ISAP)—a collaborative that includes the Illinois Corn Growers Association, American Farmland Trust, the Soil Health Partnership, and others—is expanding a demonstration farm on the ICC campus to spotlight a range of on-farm conservation practices, including constructed wetlands. TWI is designing a wetland for the site and is in the process of joining the broader partnership. 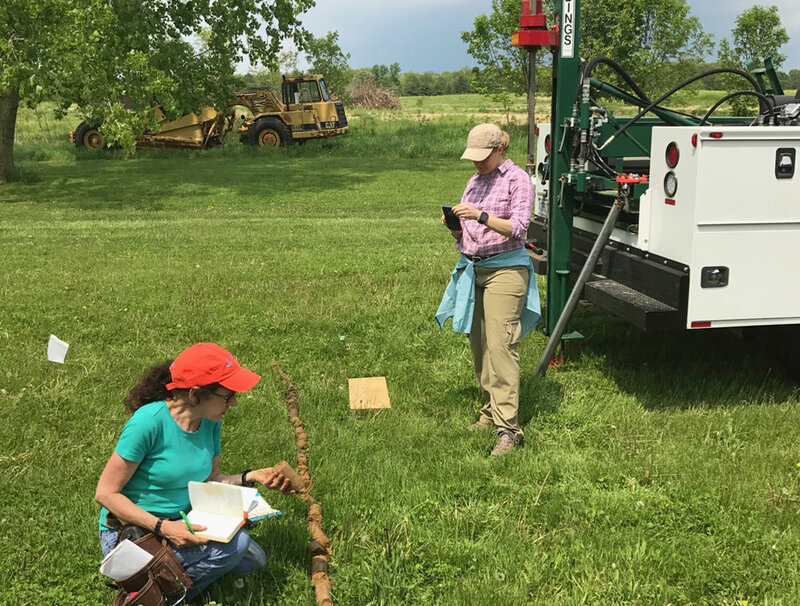 Dr. Jill Kostel (right), TWI’s senior environmental engineer, helps NRCS Geologist Diane Lamb take soil borings at the future site of the constructed wetland at Illinois Central College. Photo by Pete Fandel/ICC. The ICC farm began in the late 1970s with years of research on the effectiveness of in-field practices like cover crops and nutrient management. Now, through the ISAP partnership, it will feature a bioreactor, a drainage water management field, and the TWI-designed constructed wetland, as well as a new “sustainability center” building, all on 50 compact acres. A map of the Illinois Central College demonstration farm showing the future site of the constructed wetland and other conservation practices. Illustration by Caroline Wade/TNC. Pete Fandel, a professor of agriculture at ICC, first did work at the demonstration farm as a student and now has led management of the site for the past seven years. As a farmer himself and former crop specialist with the University of Illinois Extension for nearly two decades, Fandel knows the importance of hands-on demonstration paired with good data to show farmers that practices are effective. He’s also enthusiastic about being able to readily disseminate research on the new practices, including constructed wetlands, through ISAP. TWI hopes to build the ICC wetland by the end of 2017. Once it’s implemented, the Illinois Corn Growers Association—a partner in TWI’s larger farm-based wetlands project—will conduct water quality monitoring to measure its nutrient removal. Meanwhile, Dr. Kostel will continue exploring other partnerships that can help raise awareness of constructed wetlands and their effectiveness at removing nutrients, and TWI’s new field outreach specialist, Jean McGuire, will be hard at work recruiting new farmer prospects to build a constructed wetland of their own.